Jeff Miller here, one of the two astronomers from St. Lawrence University. I’m here with my SLU colleague Aileen O’Donoghue and a group of faculty and students from Union and UPR who are observing during the week of Thanksgiving. Becky Koopmann once again serves as our fearless leader (although why she puts up with me, I’ll never know). There’s nothing better than leaving the cold, icy weather of northern New York behind to bask in the sunshine and radio waves streaming towards Arecibo! 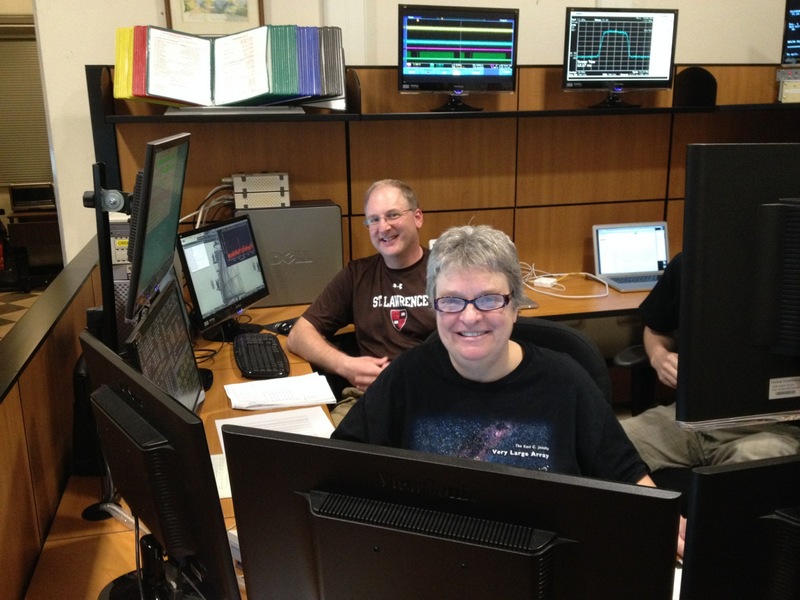 Aileen and I are enjoying our first night of observing, and things are going very well. There was a slight break in the observing while technicians investigated a strange noise in the dome. Fortunately, it turned out that nothing was found, and observing resumed. We’ve had many detections tonight, and consumed many salty snacks. One of the more exciting detections was a “dark” source that Martha suspects is an OH megamaser. A very exciting observation, indeed! We’re here for two more nights before the crew from St. Mary’s arrives, so we’re looking forward to more exciting discoveries. If you haven’t heard, 2009 is the International Year of Astronomy and, accordingly, lots of events are planned for the year. About a month ago, ESO (the European Southern Observatory) organized an event called “Around the World in 80 Telescopes” which had live webcasts from eighty telescopes in twenty-four hours. Of course, you can’t visit eighty telescopes and not include Arecibo Observatory. I can’t get the embedding to work right now, so head here to watch the video on Arecibo. Of course, you should check out all the other telescopes, too. I’m making my way through them slowly. The HI Mass Function: What Do We Do With All These Galaxies? As Betsey has mentioned, ALFALFA is a great way to find hydrogen-rich galaxies regardless of their stellar content. With ALFALFA, we can find lots of galaxies, including a lot that have very few stars and are therefore incredibly dim. This is just another way to learn about the incredible diversity and structure in the Universe around us, and when we’re done we’ll have a big pile of about 30,000 galaxies to work with. There’s a lot that we can learn about the Universe in this way, but I’d like to tell you about just one: the HI Mass Function. We call it the HIMF for short. You may have heard about the recent discovery of an Earth-sized planet that is not quite twice the mass of Earth. Remember, this isn’t an Earth-like planet because it is much too close to the star it orbits to be habitable. I happened to find this announcement especially interesting because I had just attended a talk the day before where Arecibo’s role in exo-planet detection was mentioned. Pulsar B1257+12 was observed at Arecibo and, through close examination of the data, astronomers were able to determine that it hosted two planets, of a few Earth masses, in 1992. Since then, they have detected a third planet and a possible fourth. These extra-solar planets were discovered several years before the “first” exoplanet detection around 51 Pegasi in 1995. I think it’s worth remembering that the first exoplanets, and the first approximately Earth-mass planets, were discovered by the Arecibo radio telescope. Now, you aren’t going to be able to find habitable planets around a pulsar (at least, not habitable to any sort of life we know), but the fact that planets can exist there offers a lot of insight into theories of planet formation and stellar evolution. When I left you last, Shan and I were headed to Palomar Observatory near sunny San Diego. 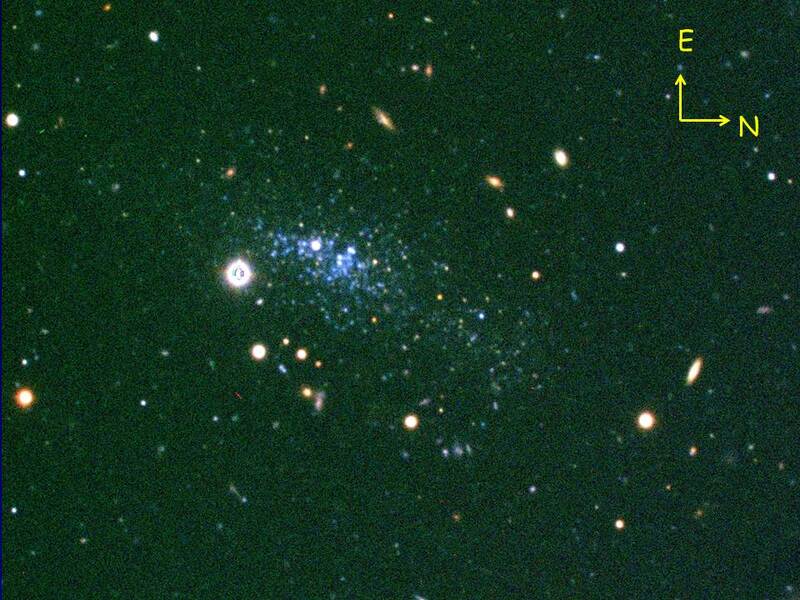 We were going to look for signs of metals in star forming regions of gas-rich dwarf galaxies. That’s a mouthful, but what it comes down to is that hydrogen gas is what galaxies turn into stars, and stars fuse and burn hydrogen and helium to make the other elements we call metals (some elements can only be formed in supernovae, the final death stages of massive stars, but it comes down to the same thing: star formation sets the whole process in motion). At the end of March I had the opportunity to visit Palomar Observatory, near San Diego, with Shan, a younger student in the ALFALFA group. 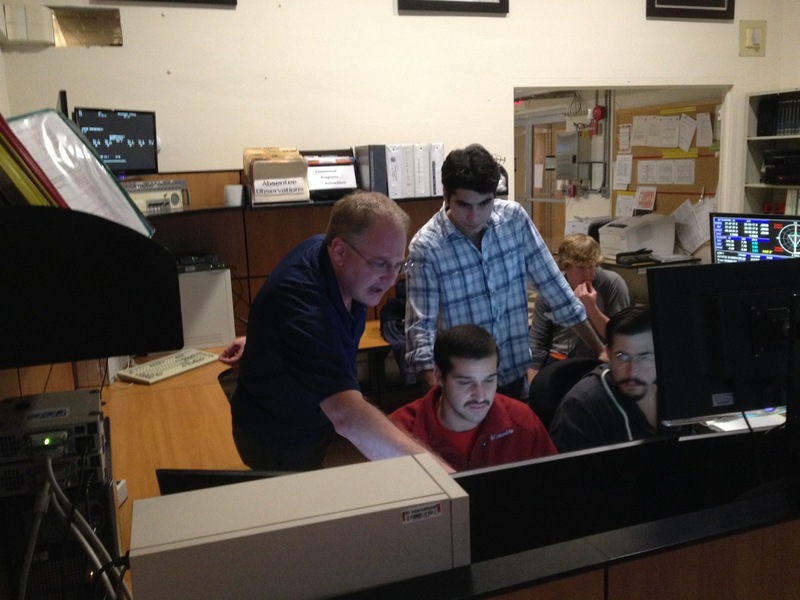 We were there to “follow up” on some detections of dwarf galaxies that we had made with ALFALFA. We can learn a lot about galaxies by observing their neutral gas, which Arecibo helps us find, but when we want to get some information on the stars we need to use an optical observatory, and that’s what took us to Palomar. In particular, we were interested in looking at the star formation histories of these dwarfs and the amount of metals that they contain. Astronomers have this weird habit of referring to pretty much any element that isn’t hydrogen or helium as a “metal,” even though we all know from chemistry that that’s not accurate. What’s important, though, is that these things astronomers call “metals” are the heavier elements that can only be made in stars or, in some cases, in catastrophic stellar death throes called supernovae. These are the important elements that make up your everyday life, like oxygen, carbon, iron, even gold. Since metals are made in stars, looking for metals in galaxies tells you something about the formation of stars in those galaxies over their lifetimes. 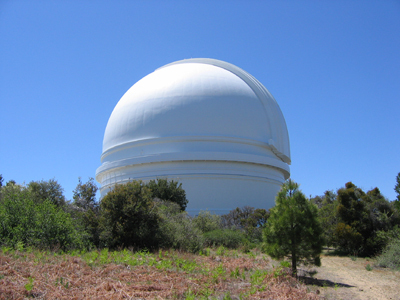 The Palomar 200 inch (5 meter) telescope dome. What, specifically, were we looking for?